Alpha Gods: Emergence now available from the OUC Store! Reprinting the long out of print original Alpha Gods graphic novel with 16 pages of all new material, including rare pin ups and an article on the influences that inspired the book by series creator, Ian Sharman. 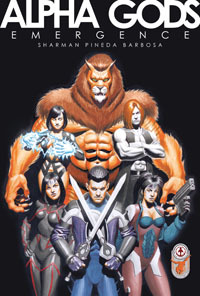 Launched at the London Super Comic Con, Alpha Gods: Emergence is now available to order direct from the OUC Store. Get your copy now as they’re sure to sell out fast! Order Alpha Gods: Emergence here. AWARD WINNING “HYPERGIRL” GETS HARDCOVER RELEASE FROM MARKOSIA!